A yummy recipe from George Stella’s Real Food Real Easy cookbook. Serves 4-6. Calories: 460, Fat: 19 g, Protein: 63 g, Fiber: 1 g, and Net Carbs: 4 g.
ADD margarine or butter to a large skillet over medium-high to high heat, until sizzling. Add chicken breasts and brown well, about 3 minutes each side. TRANSFER chicken to a slow cooker set to low. Add the chicken broth to the skillet the chicken was cooked in over medium-high heat and use a spatula to scrape the bottom, breaking up any glaze the chicken may have left in the pan. Heat broth until simmering. ADD the cream cheese, broccoli florets, salt, and garlic powder to the slow cooker and then pour simmering chicken broth over top. COVER and let cook 5-6 hours, or until chicken is thoroughly cooked. After the first hour of cooking, stir well to disperse the cream cheese throughout. WHEN chicken is finished cooking, set the slow cooker to high and stir in shredded Cheddar cheese, until melted. Serve immediately. George Stella’s Tips: If you are planning on leaving the house, you can skip the stirring an hour into cooking by melting the cream cheese in the skillet before adding the chicken broth in step 2. George Stella’s Variation: The broccoli will break up into the sauce, and that’s not a bad thing, but if you’d like something with a little more texture, start with fresh broccoli or (even better) cauliflower florets. Also, you can add 2 teaspoons of Dijon mustard for a little more zing (which I did). 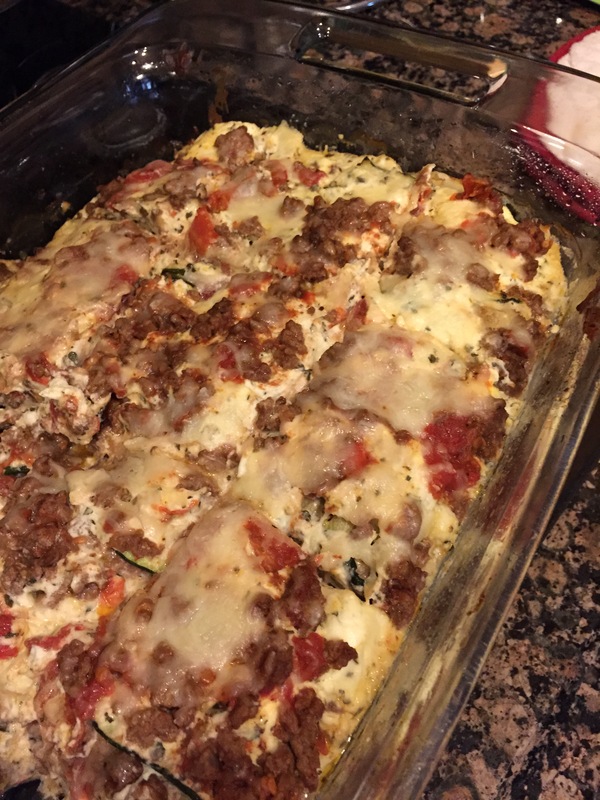 This is a great recipe that my friend Jana turned me on to. I located it at http://www.fifteenspatulas.com and made some adjustments. The recipe yields 2-4 servings. Boil the chicken wings for 7-8 minutes, then remove them to a wire rack so the excess water can drain off. Let them drip dry a little bit, then dry them well with a paper towel. Place the chicken wings directly on a sheet pan. (I use parchment paper on the pan.) Bake the chicken wings for 25-30 minutes on one side, then flip the wings and bake for another 5 minutes on the other side. The wings should have crispy crackly golden skin on the side that was in contact with the sheet pan. Options: I mix ranch dressing and wing sauce to dip my wings in. I also made these with parmesan cheese. I put the parmesan cheese, salt, pepper and garlic powder into my food processor and then just rolled my wings in the mix before baking. D’lish! I found this recipe at http://www.aboutamom.com. The carb count is not available but based on the ingredients, it is very low. Except for the fresh cilantro, add all ingredients to the slow cooker. Cover and cook on low for 6 hours. Using two forks, shred the chicken breasts. Gently stir in fresh cilantro, cover, and continue cooking for an additional hour. This recipe makes a lot of soup, about 14 cups. I topped off with a little sour cream. This is a simple low carb meal and very good. It comes from http://www.alldayidreamaboutfood.com. It serves 6-8. 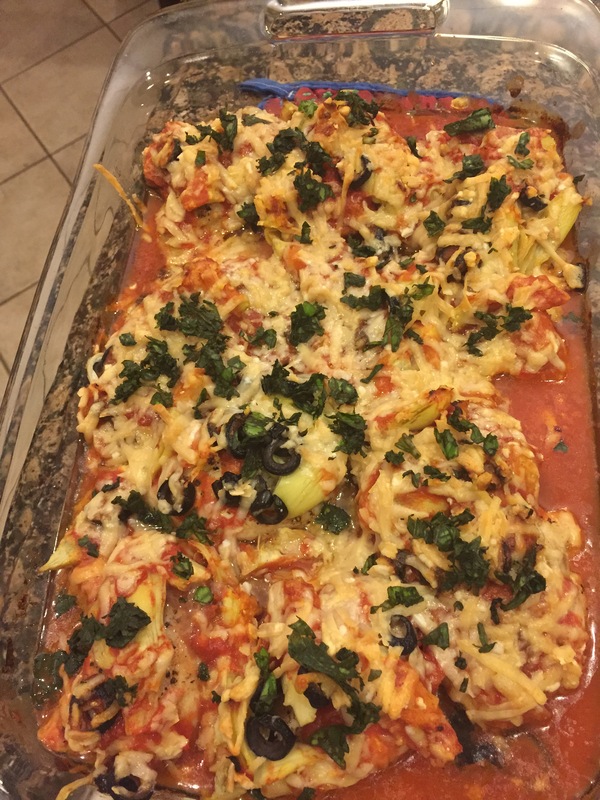 Total net carbs per serving: 7.79 g.
Using a slotted spoon, transfer thighs to a large 9×13 casserole dish and arrange in a single layer. Sprinkle with artichoke hearts and black olives. A great low-carb recipe from buttoni.wordpress.com. Nutritional info: 113.4 calories, 7.26 g fat, 1.72 g carbs, .53 g fiber, 1.19 g net carbs, 12.8 g protein. Measure out and mix all dry ingredients in a paper bag by shaking well. In a large bowl, whisk the eggs, cream and water together. Toss in the pieces of cut up chicken into the egg wash and turn several times to well coat each piece. Pick each piece of meat out of the bowl and drop into the bag of seasoned “flour” and when you have 3 pieces in the bag, holding the top closed, shake the bag to coat the chicken. Don’t put more than 3 together. Heat 3/4″ deep oil over high heat. Place the pieces closely together. Lower heat to medium-high so larger pieces don’t over-brown before done. Repeat the coating process with the remaining pieces of chicken. Brown the chicken well on one side disturbing as little as possible. Turn pieces of chicken over carefully to brown the second side. when brown and done (about 30-40 minutes) remove to paper towels to drain. Finish cooking the remaining pieces if you were unable to get them all in your skillet. This is a great, healthy low carb recipe based on the ingredients, but I do not have the carb count for this one. This recipe is great just as a meal or with a green salad. The recipe comes from alt.support.diet.low-carb, although I have made a few changes. In a large bowl combine chicken, celery, onions and eggs. In another bowl, combine the next 9 ingredients; stir until smooth. Pour over chicken mixture and toss gently. Stir in almonds and serve immediately, or refrigerate and add almonds right before serving.